My first weekend back in LA and I have already had two star sightings! 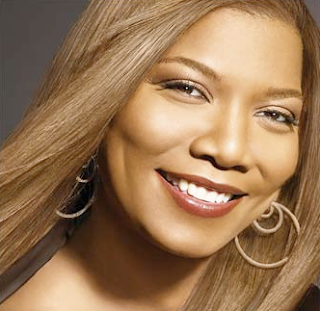 I was surprised to see Queen Latifah herself on Friday entering my gym so close after the People's Choice Awards! QL looks bigger than all the midgets here in Hollywood, but in person she is tall and has beautiful skin! She walked past me as I was drinking my coffee and talking to my mom on the phone before going up the stairs to hit the gym. I could tell it was her but she had huge sunglasses on and a beanie. Just as I was reporting that to my mom, Ali Larter was coming down the escalator decked out in Lulu Lemon attire. She is fit and looks great! She also had on huge glasses but I am a connoisseur in celebrity recognition so that minor cover up didn't phase me! Also, be sure to watch "How I Met Your Mother" tomorrow on CBS! It's their 100th episode and also the episode I got to work on! I doubt you'll see me but in the booth behind Neil Patrick Harris and Alyson Hannigan (and maybe Jason Segel?) so if you see some blonde hair behind one of them it's most likely me! ;) Stacy Keibler is guest starring and she is a hot mama! She was great on set too!